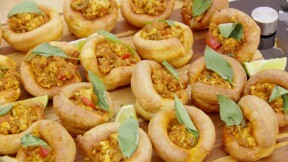 A delicious tofu curry is used to fill lightly spiced Yorkshires for a canapé with a difference. These churros are great plain or with any and all of the accompaniments. This thai tofu panang yorkshire recipe is featured in Season 4, Episode 4. For the curry paste, put all the ingredients in a food processor and blend until smooth. If the paste is very thick, add a little water and blend again. For the tofu, heat the peanut oil in a wok or a large frying pan over a high heat, add the tofu and stir-fry for 10 minutes, turning, or until browned. Add the peppers and continue to stir-fry. Add the curry paste and cook for 2-3 minutes. Pour in the coconut milk, fish sauce and lime juice. Simmer for 15-20 minutes, or until most of the liquid has evaporated, then set aside. For the Yorkshire puddings, add a teaspoon of vegetable oil to each hole of a muffin tin. (You have enough batter for 18 small Yorkshire puddings.) Preheat in the oven for 10 minutes, or until the oil is smoking hot. Meanwhile, in a large bowl, mix the flour, sea salt, black pepper, smoked paprika, chilli powder and cumin powder together until well combined. In a separate bowl lightly whisk the milk and eggs. Add to the flour mixture and whisk until smooth. Set aside to rest in the fridge for at least a few minutes or ideally half an hour. Carefully remove the hot tins from the oven and using a measuring jug pour the batter evenly into each hole. Bake for 12 minutes, or until golden-brown and risen. Remove from oven and cool in the tins for few minutes, then remove and place onto a wire rack to cool further. To assemble, put the Yorkshire puddings on a serving platter. If necessary, gently push down in the middle of the Yorkshire to create a dip. Spoon a generous amount of the tofu mixture into them. Top each one with a Thai basil or coriander leaf. Arrange the lime wedges around the serving platter and serve. The curry filling is quite salty, if you don't enjoy salty food, you can halve the amount of soy sauce used. The curry also works well as a main meal for 4 people. Simmer the sauce for less time though, as it doesn't need to be so thick, and serve with rice. Note: This recipe contains U.K. measurements and may require conversions to U.S. measurements. It has also not been professionally tested.